Those of you who made a purchase of $75 at a LEGO store in November or December may remember that you received a gift box with your purchase. You don't? Uh-oh, better go find that thing. It's worth free brick, after all. Or maybe you don't care because the thing is so small. I've read a lot of information on several forums about how big/little or great/meh the Holiday Pick A Brick box is. Before it's too late to use it (the deadline is March 31st, YMMV), let's do some empirical measurements. Look out kids, this is SCIENCE! Let's examine the standard Pick A Brick cups. There are two sizes, small and large. I filled a measuring glass to 250mL and filled this small cup 2 times. 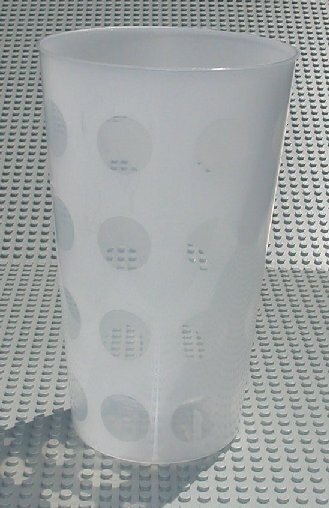 The water line came right to the top, therefore, this cup is 500mL even with the recess in the bottom. 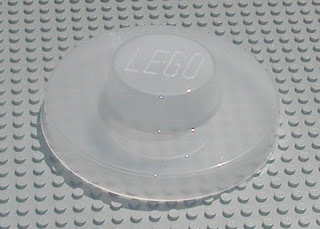 The large cup is listed on Bricklink as being one liter in capacity. I poured the contents of the smaller cup into this larger one and then proceeded to add two more units of 250mL. Again, the water meniscus was right to the top. I suppose this could have been more scientific had I done it on a scale as well so that I could measure the weight of the water. But, good enough. The lid has some volume too that is not counted in the size of the cups. I filled my measuring glass to 100mL but was only able to get half of it into the stud. So in total, there is 550mL and 1050mL of volume in each of these cups, including the lid stud, with the lid snapped on tight. 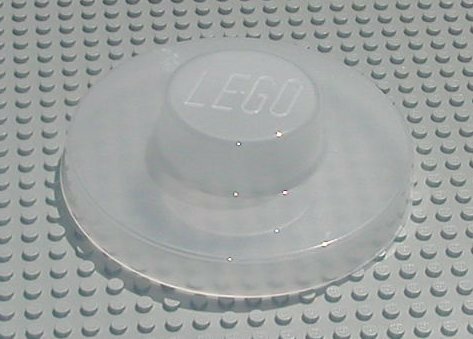 At my last visit to The LEGO Store, I was able to get 382 1x2 bricks in the small cup including filling the lid. 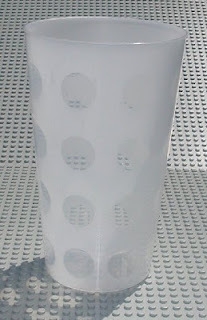 This was due partly to the fact that my local LEGO store allows overfilling of the cup. As long as the lid doesn't sit more than a brick off of the cup, they'll tape it down for you and call it good. So I was probably able to get 600mL of brick and air into the cup. You can see my mad packing skills here. All bricks were loose, not attached to each other, and very carefully placed so as to be tight but not cause scratching on their neighbors. I spent at least an hour doing this and chatting with the staff and other customers. I think when I went back for tan bricks I did something slightly different and got 384 pieces. 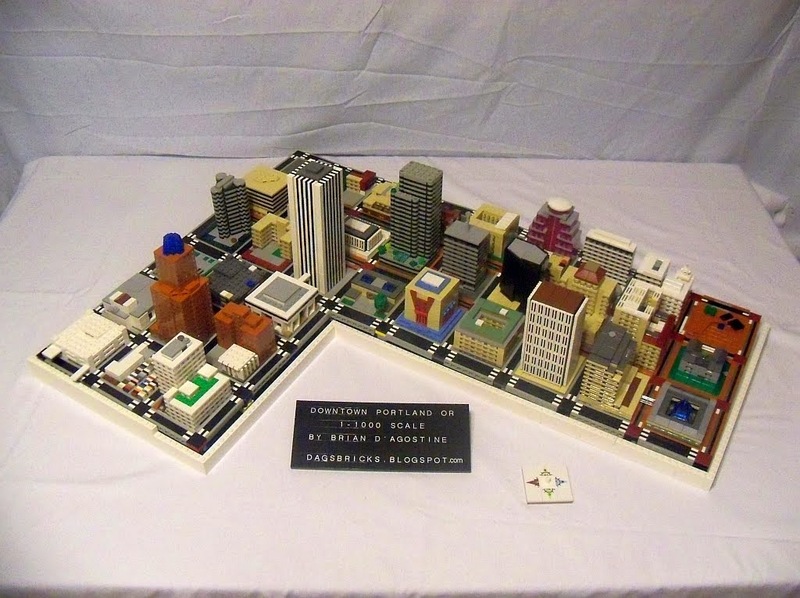 88mm x 88mm x 88mm which is equal to a LEGO brick that is 11 x 11 x 9. That's one fat brick. Cubic volume of the box is 88 x 88 x 88 / 1000 = 681mL. However the top, when folded shut is a pyramid in nature. This pyramid is about 28mm tall at the peak. The volume of a pyramid is given by the equation V = 1/3Ah where A is the area of the base and h is the height at the peak. In our case the volume is 1/3 x 88 x 88 x 28 / 1000 = 72mL. Add this to the previous cube volume and we get a total of 753mL. If you look at it intuitively, you can see rough amounts of 500, 750, and 1000 for the small cup, box, and large cup. This places the box square in the middle of the cups for volume. In fact the box is approximately 753 / 550 = 137% the size of the small cup. However this is a cube so there should be more efficiency. Let's assume that my previous cup was packed with 1x1 bricks at the same volume, therefore, 768 1x1 bricks could fit in the small cup. However I overpacked it. There are 85 bricks at the top level and if these were 1x1, we would assume 683 bricks would fit with the lid snapped tight (85 fewer 1x1 bricks). The Holiday box can fit, as previously mentioned, 11 x 11 x 9 = 1089 pieces. Through the magic of AutoCAD, I determined that you could safely add another 58 bricks into the pyramid. Based on these numbers, the box has 1147 / 683 = 168% the efficiency of a small cup. So even though it's only 37% bigger, it's 68% more efficient than the small cup. But unless you're filling it with horses, you'll likely get 95% or better packing efficiency. The slope of the pyramid is about 32°. The 33° slope is actually 27° on the brick itself and 31° when stacked. The lip of the slope alters the overall slope slightly. If you want to aim for 99% packing efficiency, you'd be lucky to find some of these slopes. My local store more often has 45° slopes but if you can find some cheese slopes they are close to 30°. You could fill the rest of the space with flowers or 1x1 plates or levers. Maybe you could slide some window glass down the sides too. So by not filling your Holiday Pick A Brick box, you're missing out on at least a cup and a half of free ABS goodness. If I STILL haven't convinced you, then just send me your box and I'll take care of everything. I used my iphone to inventory the wall at the lego store in Orlando, FL. If you inventory your local store please send me some feedback on how the process works. I tried to make the GUI easy to use from a cell phone so that you can inventory a wall quickly. Your site is a nice alternative to Brickbuildr. I'd given you some feedback on Bricklink already and it's great that you're quick to make changes. Thanks for your time on that utility.